Sunset bursts out over the Santa Cruz Island off of Venura's coastline with the beloved landmark, "Two Trees" in the foreground, a view few get to see in person. This photograph of the famous Two Trees in Ventura, California, was captured in January of 2011 after an exceptionally wet and rainy December. We hiked up to the trees and then ventured further to create an image looking from behind the trees towards the city and the ocean -a view not many ever get to see. The storm clouds and sun treated us to a perfect sunset and breathtaking view with not a bit of wind that night. It was so gorgeous that we stayed until well after dark to get some night shots of the city lights twinkling in the background. It was all worth the strenuous hike up and treacherous hike down in the dark, maneuvering around gopher holes and a slippery dirt trail. I fell and smashed my flashlight and had to make the rest of the way in the dark. The image I got that night is one of my longtime favorites. In all my years of photographing these trees since then, I have never seen it so green. Everyone's heart broke a little when we found out that one of the trees was dying. They are over 100 years old so they had lived long tree lives but these trees are so special, it was sad to see it go when it fell due to strong winds in 2016. In early 2019 two new baby trees were planted by the great people caring for the land: Rancho Ventura Land Trust. In 1898, Joseph Sexton, planted 13 Blue Gum Eucalyptus at the top of a hill in Ventura, California. The original 13 stood for 5 years until a wildfire burned 8 to the ground. 5 Remained for years, then Halloween pranksters cut 3 down, leaving us with the Two Trees that stand today. This image captures the setting sun behind the two trees, creating a beautiful sunburst of light. 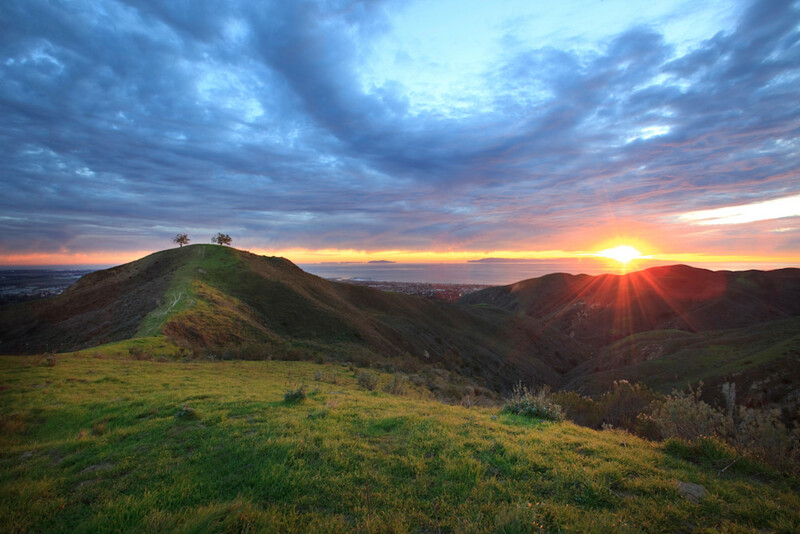 Photographed in January 2011, the hills were unusually green after a rainy December. The tree on the left is no longer standing, it died and was blown down by strong winds in 2017, then later burned in the Thomas Fire. Thankfully a new tree was planted on Earth Day in Spring of that same year by the Rancho Ventura Land Trust which cares for the property, leads public hikes and educational opportunities.